Being responsible for one's own finances is essential for future planning and happiness, but many people have a fear of banks and/or financial jargon and more knowledgeable, affluent people - possibly because they feel inadequate when entering into conversation with money-savvy people. There are also those who have been dependent all their lives on a partner making financial decisions and when their partner is no longer there they are forced into making decisions they know nothing about. 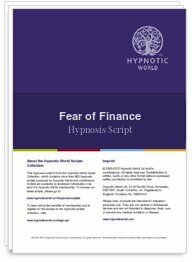 This Fear of Finance hypnosis session from Hypnotic World won't make your clients rich overnight - it will, however, help them to take control of their money and show them the steps to take so that they no longer fear dealing with money-matters.